Had for a year, some of the embroidery is starting to come out, but still love it! 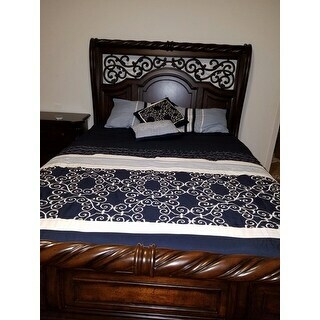 This stunning embroidered Clarissa Comforter Set adds great style with its gorgeous swirl pattern and beautiful blue stripes that complement any bedroom in your home. Relax and unwind in the luxurious softness and superior comfort in this beautiful designed bedding set. The Microfiber comforter, shams and pillows are made with the highest quality materials at an outstanding value. You can mix and match any solid color sheets and pillowcase for your style preference from our bedding collection sold separately. Dimensions 22 in. x 15 in. x 17 in. This is a great set that I used in my spare bedroom. The shams are beautiful and love the rich blue color of this. 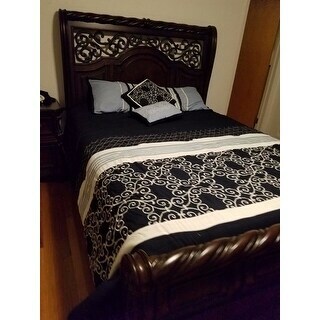 The embroidery on this comforter is very beautifully done and high quality. It wow's guests when they come in. I didn't have the 26X26 euro pillows but purchased them for relatively cheap and it made a huge difference in the look. Love it! Very soft and gorgeous embroidery on the comforter. There are two big Euro shams for which I dont have pillows but would buy to complete the look. The extra throw pillows/ breakfast pillows with embroidery give the bed and the room a royal look. Just perfect for our new bedroom set. Very happy. Beautiful comforter. Always love there bedding. Thick and soft. Great colors. True navy, cream, light blue and a touch of a silver... Fits true to a king bed. Not short. Nice looking set and looks great in the bedroom. Very soft and warm. The only thing I don't like is the stitching - it snags very easily. There are several spots where the stitching has been pulled out. You've got to be very careful about setting anything on the bed. Bought this set for our guest bedroom. It's very elegant looking and makes the room! Color scheme will match any colors you want to do for the sheets or room. Color is true to pics. White embroidery has a tendency to snag and pull but we clip the threads and continue to use. This was bought for my dad’s new place and he loves it. This is a beautiful set and very soft, looks amazing. Just enough to add a touch of elegance to your room. "I have a cat. Is the microfiber all over the comforter or in one area? " The microfiber is the outside of the set.